Sutherland Presses introduces the I-Press AB Hydro press and automation control, an intuitive and simple-to-use operating platform for its servo-hydraulic presses. Starting and ending at top-dead center (TDC), the servo drive allows for as many as three fast pressing speeds and four slow pressing speeds, to increase the efficiency of complex forming operations and reduce secondary operations. 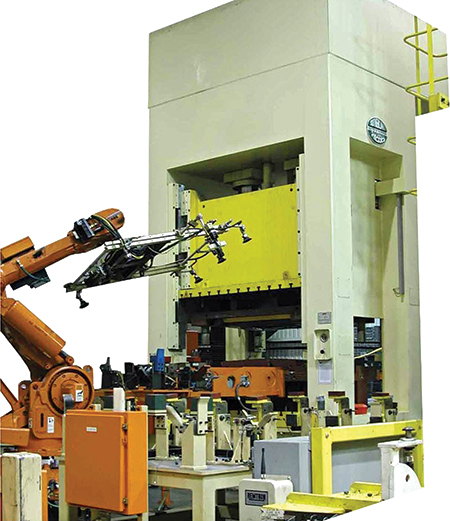 Unlike mechanical servo presses, the setup can deliver as much as 100 percent of press tonnage at any point in the stroke. Users also have the ability to program dwell time at the bottom of the stroke prior to decompression and upstroke return to TDC. The I-Press multipoint job-setup screen features a new slider-bar function—users can drag it to a setpoint, or tap to enter numeric values for all approach, dwell and return motions. With the I-Press AB Hydro control, along with servo-driven pumps and the multipoint edit screen, users can optimize the motion, pressure and position curves to optimize part output and die life. Connect the control to mobile devices for remote monitoring and troubleshooting. See also: Sutherland Presses Inc.